I had met Lizzie a few weeks before when I visited the breeder to choose between her and her sister. It turned out that Lizzie did the choosing since she came right up to me as soon as I sat on the floor and decided to play with me. Oddly, she was the most outgoing of all of her brothers and sisters in that litter but she was no interested in the people who came before me to choose their dogs, ignoring them and keeping to herself. When it came to me, though, she decided to take her chance and as soon as she put her paw on my leg I knew “I” would be a “we” from then on. This photo was taken when I met Lizzie, before I even knew her name. That’s a coffee table in the background so you can see just how small she was. I had grown up with German Shepherds as my parents raised and trained them for Schutzhund (tracking and protection) work. My Mom even competed with her German Shepherd in the 1980s and came in 3rd in the National Championship. I love German Shepherds and I was considering getting one again but I was hesitant because I remembered one downside to having one in the house: they shed. I remember finding dog hairs in my dorm in college when our dog hadn’t even been there. My Mom was a cleaning fanatic and was constantly vacuuming. So, since I am also the maid in my household, I decided that I didn’t want to spend all of my time vacuuming and using those sticky rollers to collect hair off of my furniture and clothes. So, what sort of dog should I get? Well, I knew I wanted a smart dog (I was used to being around smart dogs, after all) that also had great energy and would be a good companion. While I was researching, I recalled an incident my parents had told me about when I was a kid and they were both training dogs with their Shutzhund club: one day after training was done, the head of their club said he had just gotten a dog from Germany for a client and wanted to try him out. Everyone in the club assumed it would be a German Shepherd or perhaps a Rottweiler or Doberman. 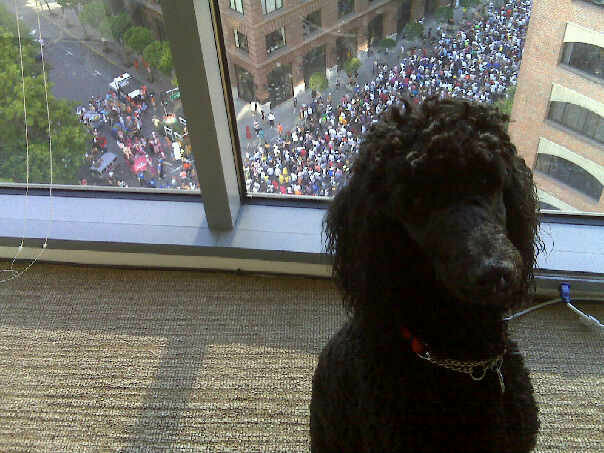 What the club leader brought out, however, shocked everyone: it was a Standard Poodle. Everyone at the club, including my parents, snickered to themselves and thought, “Oh sure – this ought to be good,” as their club leader brought the dog out to the training field. Of course, it turned out that this dog was one of the very best Schutzhund dogs any of them had ever seen: his tracking, recall, and sharp reflexes impressed everyone. 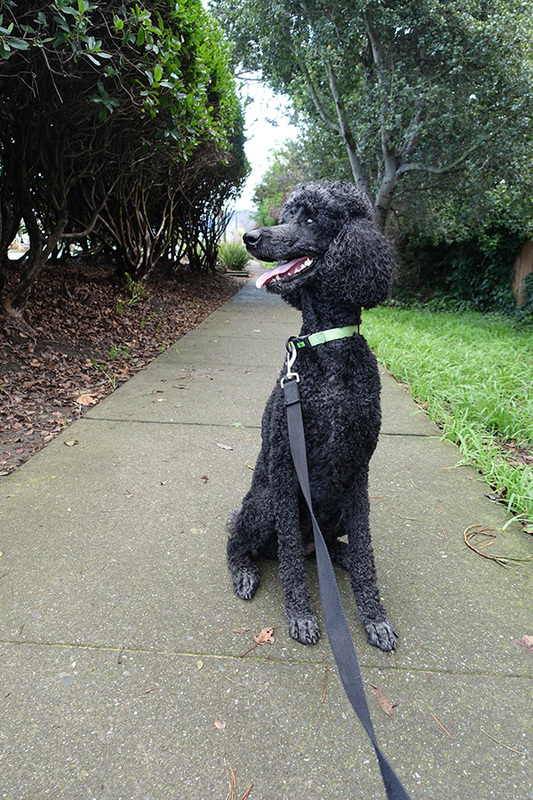 That was enough for me to know that a Standard Poodle would be very intelligent and more than capable of keeping up with me for hikes and other activities. In addition, that breed has hair rather than fur so, while it needs to be cut or it will just continue growing like human hair, they don’t shed like other breeds that have the undercoat and fur that can get everywhere. 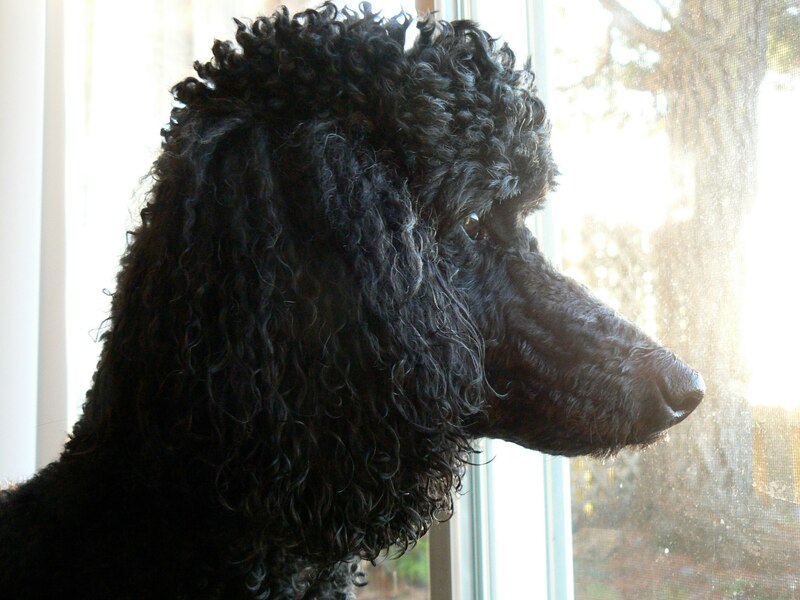 After more research, I decided a Standard Poodle would be for me and, since I had great connections for breeders of German Shepherds but not for Standard Poodles, I did even more research in that area. 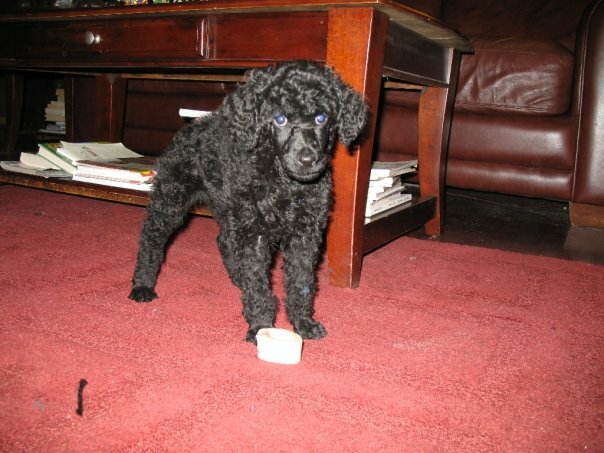 For Lizzie’s first year of life, we lived in Michigan in a house with a big yard, where Lizzie liked to run and play. 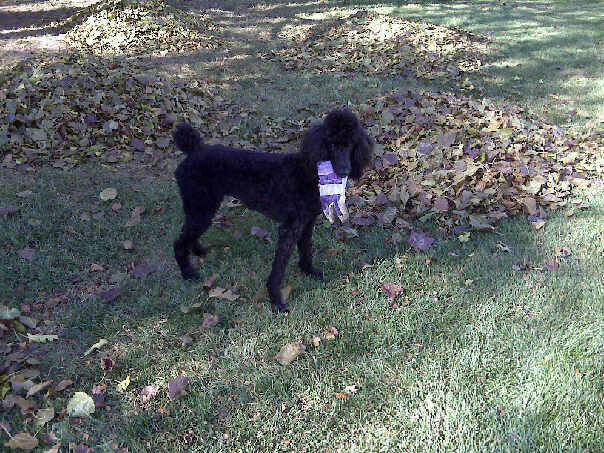 Here she is helping me rake up the autumn leaves. Yes, that’s a glove in her mouth. It was winter when she was a little puppy so I would be wearing gloves when came home, which I immediately put in my right coat pocket as I came into the house so I could pet my little girl and say hello. The gloves were leather so, naturally, that caught the attention of Lizzie’s nose and she found ways to root into my pocket to steal my gloves. This started during her first week with me and has been going on ever since. While gloves are seasonal, she has made it clear that socks are an acceptable alternative for stealing year-round. Still in Michigan a year after Lizzie came to live with me, the auto industry was in dire straights and it was a depressing place to work. I really liked me coworkers and my customers but seeing so many people laid off and no industry in Michigan doing well, I decided to chuck it all and change careers, returning to my home state of California and entering the software industry in San Francisco. We went from a 3-bedroom house in Michigan with a finished basement and huge yard to a 1-bedroom apartment in high-rise in downtown San Francisco. It was definitely a change! Fortunately, I knew from Lizzie’s personality and intelligence that she could handle it. 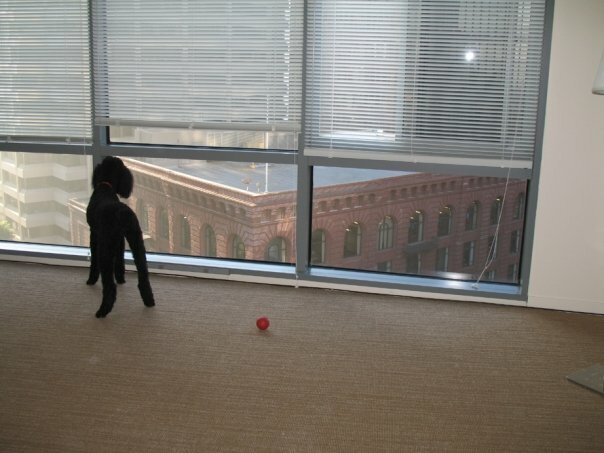 Here she is looking out the window of our place the day we moved in. I think Lizzie enjoyed watching the world below. Having said that, there were times when Lizzie wasn’t quite sure of what was going on, such as the when the Bay to Breakers crowd would gather for their annual drinking running event. I admit that the career change and having to take a major financial hit to leave everything behind in Michigan took a significant toll and it was a very rough period for me. Through it all, Lizzie was my bright spot. No matter how crummy my day was or how depressed I got, she was always there smiling and ready to make things brighter. Lizzie put up with my bad moods, my lack of energy, my tears, and my long work hours and somehow she still loved me and was always ready to welcome me home with a wagging tail to tell me all about her day with her playgroup. Lizzie got me through some very dark times, all by just being herself, and I am so very grateful to have had – and still have – her in my life. We’ve been from Michigan to San Francisco to Seattle and back again to San Francisco and through it all Lizzie’s unfailing smile and attitude when waking up that, “today is going to be the best day ever!” help me feel the same: with Lizzie, today is my best day ever, and I can’t help but smile back. So, thank you Lizzie for a wonderful 7 years and here’s to the next 7.